Trying to get excited about brand specific models of modern NASCAR stock cars is a lot like trying to get an erection from a female Lego minifig. Both acts require you to pretend that what you're lusting over isn't just an identically-produced plastic shell with fake headlights painted on. 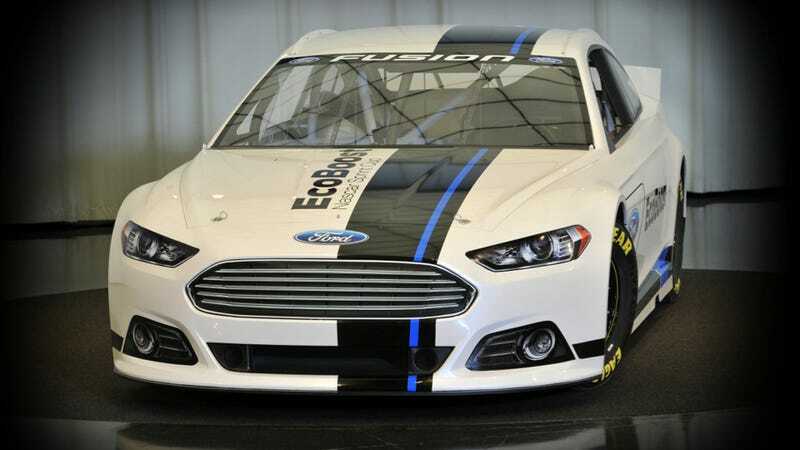 The 2013 Ford Fusion-based Sprint Cup car may finally change all of that. It's probably a sad commentary on the sport that I'm shocked to see a Sprint Cup car — NASCAR's premier racing series — that looks something like the car it's based on. It's a revelation and something not seen since the period-correct-but-funky T-Birds and Chevys of the late 1980s (the Mustang Nationwide car doesn't count). It helps that the new Ford Fusion looks great and this version looks like a somewhat realistic Fusion Coupe. Designers carried over the car's SAY-AHHHHH grille and crisp, muscular lines all the way through the body. Sure, it's still all fake, but it's just realistic enough to make a difference. They even carried over the C-Pillar and a passable version of the taillights. "We wanted Fusion to be the car that helped return ‘stock car' to NASCAR," said Jamie Allison, director, Ford Racing. "I think fans, when they see the car, are just going to smile and cheer. It is going to reengage them with the sport and make the sport better because there is just something natural about seeing race cars that look like cars in their driveways." Granted, the "EcoBoost" printed on the side is completely a joke as the only thing the rear-wheel drive V8-powered Sprint Cup car has in common mechanically with the one in your driveway is that now, for the first time, neither car has a carburetor. The new cars will debut at the 2013 Daytona 500 after extensive testing.